In a major move Tuesday, Ben Carson launched a presidential exploratory committee — a fail-safe indicator that he plans to run for president in 2016. Carson is one of the first to officially take steps to enter the race, but it probably won't end well for him: chances are, Carson will be forced to withdraw early, thanks to his inexperience and inappropriate comments about, well, a lot of things. For example? In an interview with Chris Cuomo on CNN, Carson was asked if being gay is a choice. His response: "Absolutely." Because a lot of people who go into prison go into prison straight — and when they come out, they're gay. So, did something happen while they were in there? Ask yourself that question. This certainly isn't the first time Carson has come out with some wildly offensive remarks about the LBGTQ community. 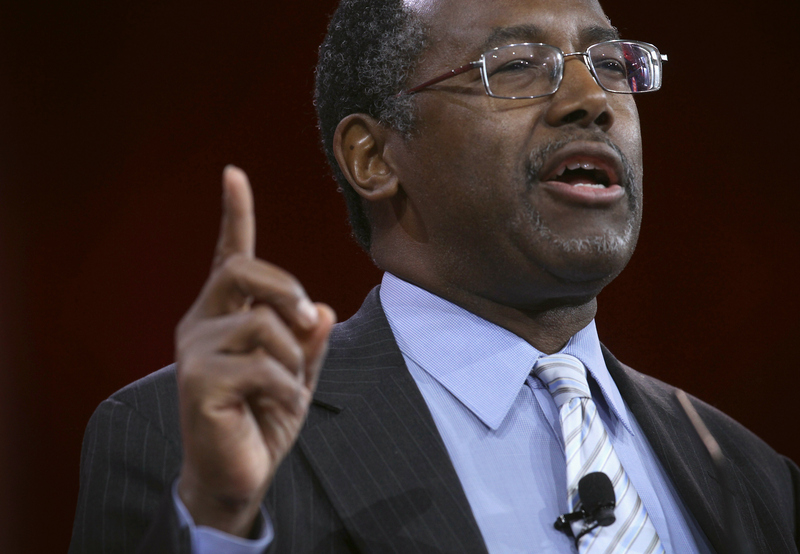 Carson said in his 2014 CPAC speech that gays "don't get extra rights." There isn't a silver lining for Carson here. Carson is an amateur at policy; even saying that is a bit of a stretch. OK, yes, he's a very qualified surgeon who separated conjoined twins, and not everyone can do that, but that doesn't make him presidential material. Carson made his political debut at the National Prayer Breakfast in 2013 with a speech scathing the Affordable Care Act. He quickly became a star among Republicans. He's a doctor; he can talk intelligently about health policy. But he's not remotely prepared to be president. There comes a time when people with values simply have to stand up. Think about Nazi Germany. Most of those people did not believe in what Hitler was doing. But did they speak up? Did they stand up for what they believe in? They did not, and you saw what happened. He finished with "But we're not going to let it happen." It's really time to go home, Ben. But it only got worse in an interview with Breitbart where he stood by his comments. I mean, [our society is] very much like Nazi Germany. And I know you're not supposed to say 'Nazi Germany,' but I don't care about political correctness. His inexperience is showing in his fundraising. The Carson campaign is funded largely by small donors. He's got about 600,000 backers, with the average check coming in at $43. Grassroots support is important, but it doesn't sustain a twenty-first century campaign. $6 billion was spent in the 2012 election, and Hillary is getting serious about 2016 — her PAC aims to collect $500 million. Wow. Sorry, Ben. No PR team, or even Olivia Pope, could fix Carson's image enough to get him the political or financial support to make even a slight dent in the GOP primary. Carson's biggest challenge isn't any of the other contenders; it's Carson himself.